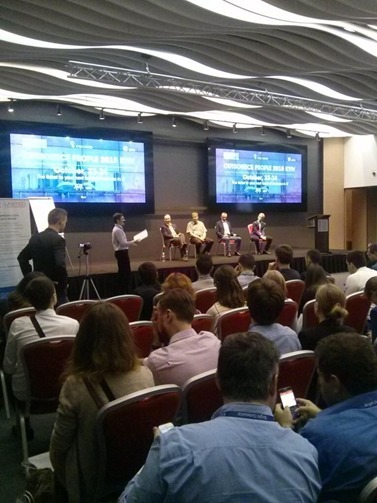 Last weekend’s Outsource People 2015 conference in Kyiv was a winner. It was packed with great sessions, networking opportunities, and a fun time for everyone involved. This conference has grown considerably over the last couple of years and this year was no exception – a huge turnout and top-notch setting at the Ramada Encore Kyiv with attached conference center on the outskirts of Kyiv. I managed to attend quite a few sessions and was impressed by the quality of the speakers and the sophistication of the attendees as well. If there was one theme in my reaction to the event, it was that the IT ecosystem in Kyiv has matured to such an extent that it’s on par with any city in the word. There have always been lots of great IT professionals around Ukraine, but the number of successful and energetic companies that are contributing to the IT scene in Ukraine has reached a critical mass and emerged as it’s own ecosystem. A good one. I met with companies providing everything from products to services, companies who service clients ranging from domestic banks to Silicon Valley startups, and everything in between. Gone are the days when I saw company after company taking boring overflow work for clients overseas. This time around, most of the shops had specialized in some way, embraced one more new technologies, or had become experts in a vertical space that would have been unrealistic only a few years ago. This is a natural progression – Ukraine has been the de facto leader in E. European outsourcing destinations for years now. But not every IT community is able to ‘graduate’ from being a successful outsourcing region to having their own true IT ecosystem. It requires that the community moves past basic outsourcing for the US and W. Europe and start developing impressive products and services of their own. After hearing some of the success stories of the attendees at OP2015, I have no doubt that Ukraine is ‘there’. One surprise was the frequency with which I was asked how Ukraine can improve their reputation on the world stage, and mature their IT industry. I suspect that our Ukrainian friends don’t see their reputation on the global market in the same way we do at SourceSeek. Ukraine has become the go-to reference point for quality E. European outsourcing destinations, easily surpassing Russia and Romania in reputation despite recent politics and fighting in Ukraine’s eastern region. They are the top dog in the region, and from here all that remains is to further that reputation both domestically and globally. The mark of a good conference is a quality roster of speakers, and Outsource People 2015 in Kyiv event didn’t disappoint. My only regret was that I can’t speak Russian and so I missed out on some of the more interesting topics. Fortunately, there were lots of great sessions in English. It was great to see that many of the speakers were Ukrainians or Russian people who had gone abroad and found success, and were returning to Kyiv to share their knowledge with the community. 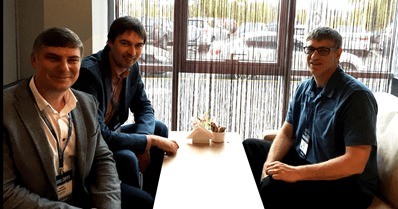 This exemplifies the strong culture of the IT scene in Ukraine, which was apparent throughout the event. Towards the end of the event, a series of awards were given out to entrepreneurs and professionals in the industry. I was honored to have been a judge for the competition, I was very impressed by the candidates. This wasn’t some local-level competition where meager accomplishments warranted awards. These were candidates with astounding accomplishments including hyper-growth, technical innovation, and some startup acquisitions with impressive exits. This brings me back to the notion that Ukraine is on a perfect trajectory to become a world leader in IT, and simply needs to keep doing what they’re doing. That said, it would certainly be helpful if some efforts were made to help promote the reputation of the industry and to protect from damage done by politics and unsavory events involving Ukraine’s neighbors. Given the level of community and deep engagement that I saw at the conference, I am confident that this will be handled well as time goes on. It’s worth mentioning the overall quality of the Outsource People 2015 event itself, thanks to founder Pavel Obod and his team. I’m sure it’s not easy to produce such a well-run event but also keep the mood light-hearted and fun. I enjoyed the presentations and discussions, but I most liked the in-person meetings with contacts that I already had, some new friends, and with people that I had previously only known online. Special thanks to Nataly Verameeva for inviting me to the conference and helping to pull it all together. Another highlight was the chance to meet and drink a little cognac with Jan Willem Tromp and Yuri Warczynsk from GLOW Management. I somehow missed their talk at Outsource People 2015, but was lucky enough to join them for dinner and drinks and I learned more during that dinner than in any of the other sessions!. Those are smart guys. Scouting the world looking for great software teams isn’t easy, especially when we’re looking for companies as good as Perfectial in L’Viv. We’ve done some trial work with them and were impressed, so it was great to have some time to sit down with them and get to know them personally. Forever ago (but actually about 5 years) I had a software project going and needed a few smart .Net developers to jump in and help. Andrew Mazepa and his team at NewLine Technologies saved the day, and we’ve collaborated from time to time ever since. Amazingly, Andrew and I had never met in person until last Saturday! With Andrew Mazapa from NewLine Technologies. Let’s not forget the service at the HUB restaurant, the setting for many meetings and general gatherings throughout the conference. The restaurant itself wasn’t anything interesting but the never-ending jokes about the impossibly bad service there never seemed to get old. Finally, I have to mention Galashtay Mike, the musician who entertained us during the conference after-party. Super cool and energetic music, a perfect ending to the event. With so many IT conferences happening each year, it’s hard to pick the winners but Outsource People will certainly be on my list. Looking forward to Outsource People 2016!